The director of BRIE Assoc. Prof. Mimi Kornazheva took part in the ASEM SIXTH SEMINAR ON SUSTAINABLE DEVELOPMENT Ïntegrated Water Resources Management for Sustainable Development" on 25-26 October 2017 in Pakse, LaoPDR. She made a presentation on the topic "Multi-level Governance of Water-Energy-Food Nexus: Sustainable Development Lessons from Bulgaria". The director of BRIE Assoc. Prof. M. Kornazheva was conferred the award “Inspirator” by the Student Union of University of Ruse. This annual award represents the preference of students for the best teacher, expressed within anonymous student vote. In the context of the cooperation between University of Ruse via BRIE and the Diplomatic Institute at the Ministry of Foreign Affairs, in December 2016 the university of Ruse hosted a prestigious international scientific conference dedicated to water diplomacy on the rivers Danube and Mekong in the framework of the ASEM Sustainable Development Dialogue (Asia-Europe Meeting). 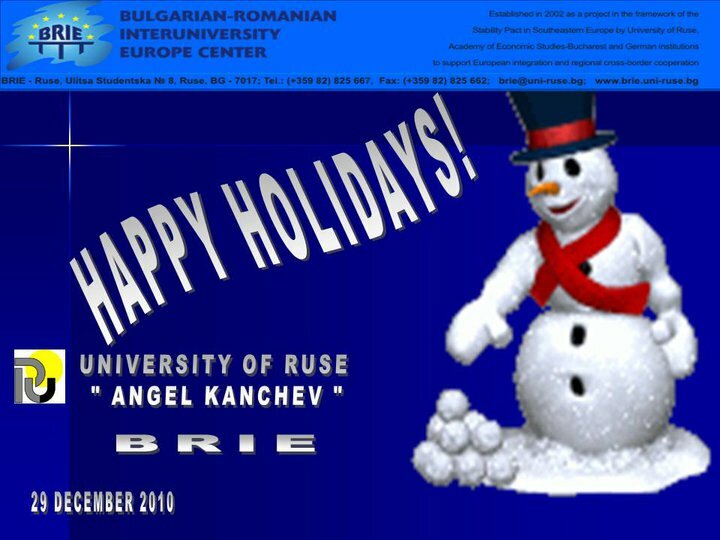 In the framework of the scientific conference of University of Ruse, BRIE director Assoc. Prof. Dr. M. Kornazheva was a moderator of a round table on the topic “DAESH: (Non)Islamic State – the first comprehensive exploration of the terrorist organization”, which took place on 28.10.2016. Prof. Vladimir Chukov, an expert in international politics and international security, and author of the book, outlined the social, tribal and regional layers of the Islamic radicalism as catalysts of the emergence of the organization. Prof. Dr. M. Profiroiu, vice-rector of the University of Economic Studies Bucharest and director of BRIE in Romania invited BRIE students to take part in the International Week of the University of Economic Studies on 07.06.2016.During the debate topics connected with the current crises of the European Union and the opportunities to overcome them. On 14.05.2016 the member of European Parliament Mrs. Maria Gabriel visited the University of Ruse. She awarded the students with highest academic performance from each faculty with a visit to the European Parliament in Brussels. She also met African students of BRIE and discussed with them her activities in the relations of the European Union and Africa. Her lecture on that particular topic students was agreed. On the occasion of Europe Day, on 11.05.2016 the ambassador of the Kingdom of the Netherlands to the Republic of Bulgaria His Excellency Tom van Oorschot visited the University of Ruse. BRIE was a co-organizer and host of the event. He delivered a lecture to students from BRIE and bachelor students, connected with the Dutch presidency of the Council of EU. National Impact of the European Integration – Maria-Denitsa Veselinova Georgieva; Integration of African Countries: Challenges and Opportunities – Ekema Edmund Muaka; The Role of Public Services in the Process of EU Integration – Sama Jayin Basile; China In The Era Ð¾f Globalization – Mariya Kamburova; Globalization and Business Communication – Meray Yuzeirova; Globalization and Religion – Gabriela Lambeva; Defining Globalization: Different Perspectives – Linda Mihaylova; The American Lobby Group or How the President Obama Tried to Restore the Foreign Relations with Cuba Through PR and Lobbying- Hristo Bakardzhiev; Washington, D.C. and the Role of the Diplomatic Missions in the Nation’s Capital – Hristo Bakardzhiev; Dynamics of US Impact on Globalization – Todor Krastev; Different Approaches to Global Threats – Daniela Atanasova. BRIE students and BRIE director participated in a public discussion on the topic “The Parliament of Europe” under the project “Face European Parliament” COMM/SUBV/2015/01/0008. The event took place in two stages: in August 2015 and on 19.11.2015. The aim of the forum was to increase the awareness of the Bulgarian society on the EU policies set out in the Europe 2020 strategy. The event was covered live on BNT 2 and BNT World. The research project BRAINS realized within the framework of BRIE was awarded at the Annual RINNO ceremony for most innovative partnership within the framework of the project “RINNO – Model for Increasing the Benefits from the Cross-border Cooperation between Romania and Bulgaria through Research and Investment, 2R-3.1-1(4), MIS 168”. The ceremony took place on 26.06.2015 in Grand Hotel Riga, Ruse. The prize received was in the category “Young innovator”. At the invitation of the Diplomatic Institute at the Ministry of Foreign Affairs of Bulgaria, Assoc. Prof. Dr. M. Kornazheva was included in a delegation of the Republic of Bulgaria which took part in a seminar within the framework of the Europe-Asia dialogue for sustainable development (ASEM) with regards to the Danube-Mekong Initiative. BRIE alumni took part in the initiative of the President of Bulgaria Rosen Plevneliev, called "Youth Vision for the Development of Bulgaria". The initiative takes place for the third time and aims to gather the ideas of alumni with greatest academic results regarding the prospective policies for the development of the country. The academy took place (for the second time) between 14-18th of July 2014 in Sandanski (Bulgaria) with the participation of 27 young people from Bulgaria, Romania and Greece. It was organized by the Economic Policy Institute in Bulgaria and the Hanns Seidel Foundation. The aim of the academy was to discuss the cooperation between the three countries and to hear the opinion of the youngsters about their countries as member states of the European Union. The forum called European Youth Event (EYE 2014) gathered in Strasbourg, France over 5000 youngsters between 16 and 30 years old from all EU member states. It took place between 09 and 11th of May. Bulgarian and Romanian students from BRIE and the Academy of Economic Studies – Bucharest also took part in the event. The organizers were the European Parliament and the European Youth Forum. The International Youth Academy on the topic: Is my Europe the same as yours? was financed by foundation “Hanns Seidel” and the Institute for economic policy. The event took place in the town Sandanski in the period 15th- 19th of July. 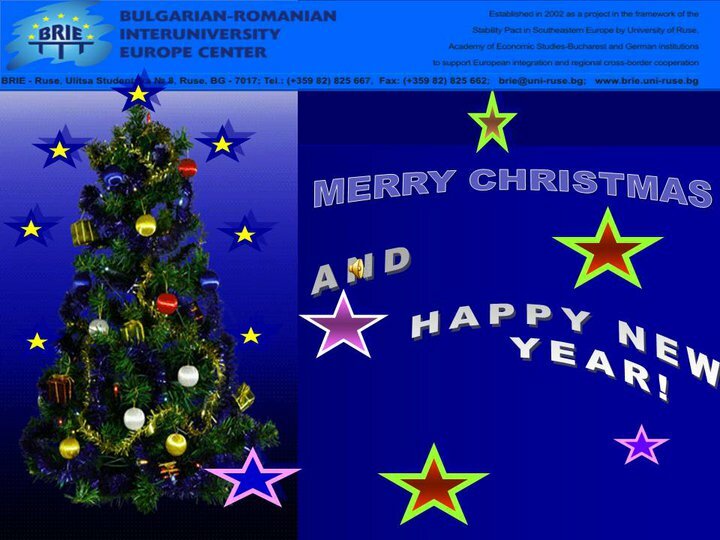 It gathered participants from Bulgaria, Romania and Greece. They discussed the local dimensions of key topics from the agenda of the European Union, the cross-border cooperation between the three countries, the concept for branding etc. Students from the University of Ruse “Angel Kanchev” took part in a summer school in European integration which took place from 5th till 11th of May in Brussels. 46 students and professors had the opportunity to visit the European institutions and to observe their work within the framework of the traditional Summer school in European integration of the Bulgarian-Romanian Interuniversity Europe Centre. The Minister of Regional Development and Public Works Rosen Plevneliev said that it would be his pleasure to accept the invitation to be a lecturer in fall at BRIE Ruse and Giurgiu. We kindly invite all our students of BRIE to meet Erhard Busek - special coordinator of the Stabiliy Pact for South-Eastern Europe. On May, 9th of May, at 16h, all students of BRIE are invited to meet the German ambassador Matthias Hoepfner. The ambassador will first hold a lecture about European politics, then students have the chance to discuss with him current topics. The diploma award ceremony for the graduates took place together with the introduction day for the new Master students on Saturday, 16th October 2010 in order to ensure the transfer between graduates and new students. The Graduates from last year will receive their diplomas from the Vice Rector of University of Ruse. The diploma ceremony will start on Saturday, October 16th, 11 o'clock in the new BRIE premises at Ruse University (5th floor). The semester for the new BRIE Master students starts at Saturday, October 16th 2010 at 10 o'clock in the BRIE premises. On Monday 11th October German Chancellor Angela Merkel has been granted a doctor honoris causa title by the Bulgarian Ruse University "Angel Kanchev". The German Chancellor pointed out that the "Bulgarian-Romanian Interuniversity Europe Center" is a flagship project of Ruse university and she thanked especially all German, Bulgarian and Romanian partners supporting this project.